The New Millennium Art Factory Program. The New Millennium Art Factory is an independent art project run and sponsored by parents and a unique art teacher at the Adams Memorial Free Public Library, Alfonso D. Acevedo since 1995. Classes are held on Saturdays during the spring. Starting on March to June 28th every year. The library has provided the space for these classes since 1995. For reasons out of control these art classes have a temporary location at 501 Roosevelt Avenue, in Central Falls sponsored by India Museum Society and at 504 Weeden Street, in Pawtucket at CMI, and at Navigant Credit Union Central Falls Branch. 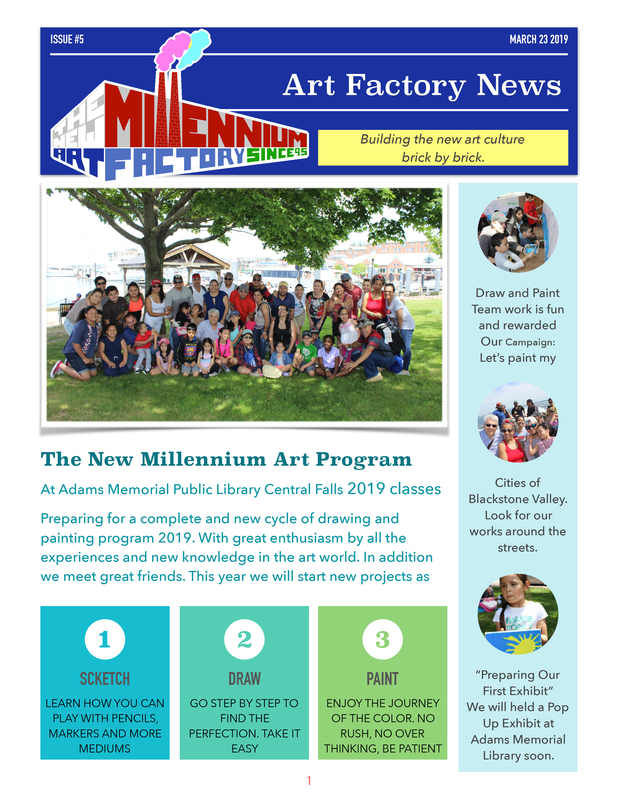 Adams Memorial Library Central Falls host an art classes collaboration on Spring-Summer with the artist Alfonso D. Acevedo as Art Instructor. Also the program have the greatest help of parents and few art assistants. This project for children’s 6 years old and up and their parents promote the family and community integration with 12 weeks on Saturdays with a closing exhibit and a new Project called “Let’s Paint My City” (“PAL” Program which display Pubic Art in the Commercial Windows) and several performances of the dancing group along with this Public Art Temporary Exhibits. This project help communities to fight the lack of these programs and volunteers to help keep at-risk children off the streets. The program begins with a work plan that includes classes that accommodate the needs appropriate to the ages of the participants . Regularly participants are children and young people from Blackstone Valley communities who do not have access to arts instruction in their respective schools . Also students who come to the state and who had no experience in the arts . And / or students who wish to advance their artistic skills. The A group of students age 6 to 9 years old. The group B with students from 10 years old to 18 years old. The first part of the program begins with training in the use of pencil, graphite and charcoal. Theory of this technique and its applications in the different papers or media. All this is offered in simple and easy to understand manner and for the purpose of encouraging art appreciation while practicing. The two hours are divided into 4 stages of 30 minutes with a break after the first hour 10 minutes. The first hour has a concentration in the knowledge and overview of geometry as the main basis of the program to understand how an image is formed . In the second hour, with the assistance of two artists ranging synchronized exercises for each student to keep the attention for the development of a piece of art using the essential processes are beginning arm movements , hand and fingers with visual coordination and the body in general to achieve artistic and natural brushstrokes . Also, the selection of color, art brushes management and control of the media . The process called painting with productive harmony, as taught through the process of movement, inspiration and confidence. The students can achieve completion of a work addressed in each class.